Included configuration is used to control Yaesu FT-991 transceiver using the latest free version of HamRadio Deluxe (v5.x), with some limitations. This is a very simple to use multi-platform Java application which can be used to convert CAT commands. It can be used to allow controlling newer transceivers using old application (no more updated). The application is user configurable for different transceivers, no matter the CAT protocol used. 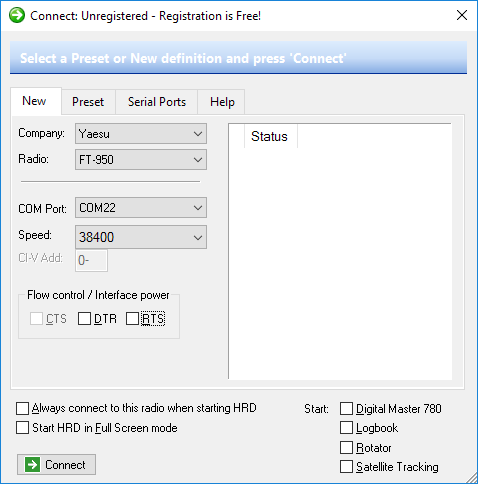 As an example you can work in DigiModes using the latest free version of HamRadio Deluxe Suite (5.24.0.38) with the new Yaesu FT-991 (which is not supported in that version of the application) using the Yaesu FT-950 model in HRD. Without this application, you will not be able to set or read the frequency from the radio as the number of digits used to represent the frequency is higher for FT-991 (as it covers VHF and UHF bands too) making this application almost useless for the new transceiver. which natively supports the Yaesu FT-991 transceiver. If you are like me and you like the old free version, then go further with the reading. Use two virtual COM ports to be the man-in-the-middle between the transceiver and CAT application. Users can define new conversion rules based on patterns by just editing a text configuration file. Use this application on your own risk. If you write wrong conversion rules in the configuration file, you can send commands that can brick some transceivers. In order to use the application, you need two virtual COM ports. For this purpose, I recommend you to use the well-known open source solution named com0com. You have now two new COM ports (COM22 and CNCB0) virtually connected. You can see the two devices in the Device Manager under “com0com – serial port emulators” as in the picture below. The package is a zip archive containing two files: catconv.jar and catconv.cfg. Unzip the two file in a new folder of your choice. Select the virtual COM port previously created (named CNCB0) as the “Bridge COM Port”. This will be used to connect to HamRadio Deluxe. 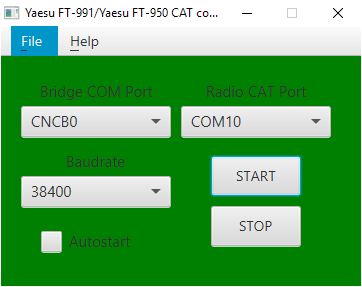 Select the COM port used by your transceiver CAT interface as the “Radio CAT Port”. This will be used for the communication with the radio. In my case this is COM10. In fact is the port named “Silicon Labs Dual CP210x USB to UART Bridge: Enhanced COM Port (COM10)” in Device Manager. Select the Baudrate. 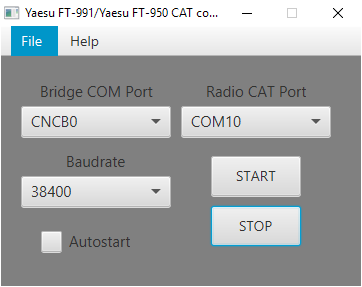 Use the value configured in the radio CAT setup menu. I recommend you to use the higher available speed. 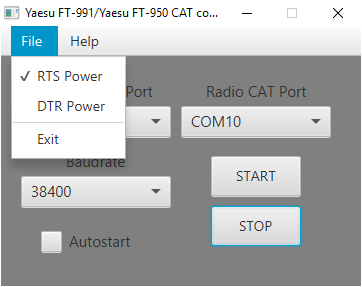 Yaesu FT-991 require to set RTS in order to control it over CAT using the USB connection. For this purpose, in the File menu verify that “RTS Power” to be checked. All settings are saved in the configuration file and automatically used at next application start. You are now ready to use it. Do not check “Autostart” before you are sure that everything work as expected. Click on “START” button. The window background will go green and the converter will become active. Use the following document to configure the settings in FT-991. Discard the section related to the HRD version 6 configuration. Start HamRadio Deluxe. You will be prompted to define a new transceiver connection. Define the preset as in the following picture. Use the virtual COM port defined previously and FT-950 as the radio model. You don’t need to check “RTS” as this line will be controlled by the java application. Click on “Connect” button to connect to the radio through the CATconv application. You will be able to use most of the functions in HRD 5.x with your new transceiver. When you download the application from my web site a special configuration file is included (catconv.cfg). Some of the parameters are self-explanatory, corresponding with the ones from the GUI. ‘1xx’ – conversion rule for the data passing from Radio1 to Radio2. You can have up to 99 rules. ‘2xx’ – conversion rule for the data passing from Radio2 to Radio1. You can have up to 99 rules. Each rules contains two sections, separated by the ‘<R>’ tag. First section contains the patterns for the input data which will trigger the conversion. Second section contains information about the conversion rule to be applied when that pattern is found in the input data. Each section contains n comma separated elements, where n is the number of bytes for the input command (first section) or the converted command (second section). <S…> tag contains a number of chars (>=1) following the ‘S’ letter. Several String type pattern elements can be represented as a single element. For example <SF>,<SA> can be represented as <SFA>. px – where x can be any positive decimal number representing the byte position of the original input data which will be used on the current position of the replacing data. More tags will be added in the future if this will help extend the support for other transceivers, based on users feedback. Version 0.1 (Jun 29,, 2016). Version 0.2 (Jul 1, 2016).